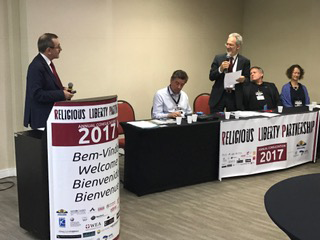 Keynote address on multiculturalism and secularism facing understanding of freedom of religion or belief, delivered by Dr. Liviu Olteanu at the religious liberty partnership hosted in Brasilia. The following keynote address (here summarised) was issued at the Religious Liberty Partnership hosted in Brasilia, Brazil, on 3-6 April 2017, to which the Secretary General of the AIDLR, Dr. Liviu Olteanu, was invited as a special guest by the Religious Liberty Partnership and Anajure (Associação Nacional de Juristas Evangélicos). 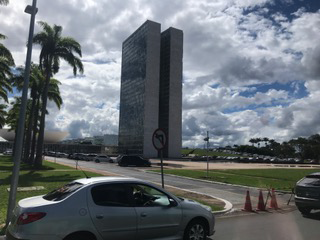 The President of Brazil and members of Congress were in attendance where Dr. Olteanu spoke on the subject of: «Multiculturalism, Secularism and Religious Freedom». A short resumé of Dr. Olteanu’s keynote speech follows: ‘To avoid a mutual undermining of the authority of the human rights standards, we have to know one another better. What is needed is a critical defence of universal human rights in a way that gives room for different cultural and religious interpretations. Some of the challenges are: multiculturalism and secularism. Multiculturalism requires teaching to live with differences. Nations and people need to develop a deeper understanding of the religious and philosophical conceptions of other civilizations. But another spectrum is secularism that is misunderstood or aggressive – that is not adequate in the context of the time. The terminology of secularism is misunderstood. According to Mitchell Tyner, “secularization” occurs in many versions, along a spectrum from: a) benevolent neutrality toward religion, b) to overt hostility toward religion. In secularized societies, we find that ‘religious freedom’ and ‘religious equality’ have become suspect and feared ideas. Religious freedom often involves accommodation of religious practices. On ‘religious equality’, there are many aspects that must be addressed: - What do we mean by ‘equality’?- How do we measure it? Those of us who have confronted the matter in such areas as the accommodation of religious practices in the workplace know that blind neutrality will not produce equality., The widely perceived conflict between ‘religious freedom claims’ and the ‘equality claims of others’ is a grave danger to the future of religious freedom. Secularism is the principle of the separation of government institutions and persons mandated to represent the state from religious institutions and religious dignitaries (…). Photos: Dr. Liviu Olteanu during his presentation at the RLP in Brasilia (Brazil).